15 years ago this week (Jan 18th, exactly) Chan Yuk Lin Online (CYLO) started with an internet search when I first learned how to type Idy’s name in Chinese. The site first resided on my student web account at school, and moved around from many free web hosts with different URLs. Finally, the domain name created in April 2009. Here’s to the next 15 years…? 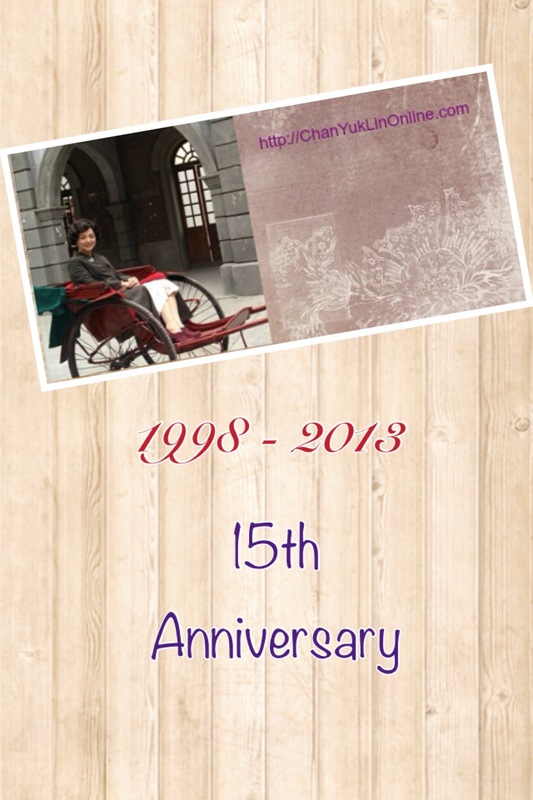 Happy 15th Anniversary Idy Chan Online!!! Thanks for keeping all of us english fans updated on such a phenomenal actress~! Wows 15 years ago…… I probably just started kindgarten? Thanks… I guess it’a hard to let go of people and things that you first love at a young age, and Idy is one of them for me. People come and go over the years… but i hope to continue maintaining it as long as I can, just my way of keep a journal… sort of! haha i may be young but i am not someone who is extremely “interested” in just anything. 16 years ago, I may not have known how to use a computer … but I did watch and remember my first Nancy drama, which happened to be her returning drama: A Kindred Spirit. Probably like you, since I grew up watching her, I grew an attachment haha. There’s a lot of artistes I “like” for their acting or personality but at this age, I can differentiate between admiration of someone’s work vs admiration of a person as whole. Surprisingly though, I’ve developed this sudden respect and interest for Idy too! Haha~ I would 100% credit you and your website for the additional understanding. + Be My Guest interview. Now it’s pretty much my daily hash tag I look up on weibo. I hope Idy visits your site~!! I think she’d really appreciate what you have done to make her more internationally recognized. thumbs up! I believe people change with time. We learn about the artistes for their work, and eventually their persons, and that’s the way I’ve grown to love Idy. Perhaps it’s because she’s such a private person, so my persistence on keeping the website and looking for her news hasn’t stopped all these years. Yes – she knows this site and has visitted, but I have no clues how often she goes here. I sense that she “knows” me as well, but then I’m too a “private” person on the net, and I don’t really advertise this site much. ahhh but i realize i have to be careful about stuff i post. it surprised me as too how controversial things could get ….. i felt bad about my idy & andy post. i.e some people were starting to critic andy which wasn’t my intention. do you know how i can delete the topic?? Really!? Sorry to hear about the critics on your work. is it at baidu? I don’t think they allow editing or deleting any topic. Not sure if you still remember me. I also want to say thank you for doing such a good job in keeping this site always upto date! I still remember when I first stumble upon your site years ago! I was so happy then and still is! I always come here to learn what is happening to Idy. Thank you! Yes – I remember, is it Jenny or Jennifer? 🙂 Anyway, didn’t you also send me many old and rare magazine clips of Idy years ago? I’m very happy that you go CYLO for Idy’s news. THANK YOU!! !